Miami Dade College’s Wolfson Campus serves 32,000 students across a little more than 2 million square feet of buildings, including the Miami Culinary Institute, Miami Animation Gaming International Complex, and the Miami Fashion Institute. This urban campus has won the 2018 Green Cleaning Award’s Honorable Mention for its ability to work with the entire school community and local neighbors to promote sustainability goals through green cleaning efforts. Miami Dade College has made a commitment to sustainability the cornerstone of all of its capital improvements to facilities and grounds. In fact, the campus’ sustainability goals are printed in the Core Value Goals of Miami Dade College 2015-2020. The college supports these sustainability goals with a robust green cleaning program. They have been able to cut their chemical list in half, using only products that are green certified by third parties today. The use of a microfiber system, HEPA-filtered vacuums and EcoLogo and EPA certified paper products have all minimized the cleaning program’s impact on the environment. Their approach to sustainability it widely marketed throughout the Wolfson Campus, with an urban organic garden built right in the middle of the campus. The garden itself provides freshly grown produce to the college’s Miami Culinary Institute and a local restaurant. The Culinary Institute is an eight-story, seed-to-soil Silver LEED-certified building with an exceptionally low carbon footprint. In addition to a strong relationship with the on-campus Miami Culinary Institute, the green cleaning program at Miami Dade College has built a partnership with the Campus Sustainability Committee. This committee consists of faculty, administration and students with active support from the neighboring community. They use the college’s public television station to report on sustainability initiatives and how the campus can assist in going green. Since the college is located in an urban environment and the administrators, staff and students are all involved in our Green Initiative, the school is able to form partnerships with our neighbors around sustainability. According to Cristina Mateo, Senior Director of Administration, some of the partners include the City of Miami, local condo associations, the federal courthouse and other local small businesses. 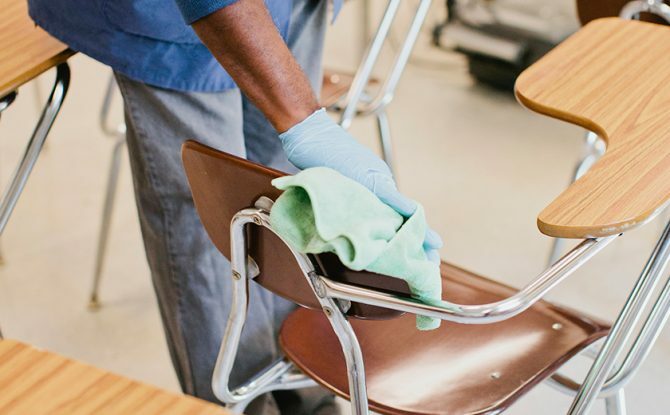 The Green Cleaning Award for Schools & Universities is the only award dedicated solely to recognizing schools and their facility leaders for the tireless work of promoting clean, healthy and sustainable school buildings. The award highlights schools with innovative, health-focused and environmentally minded cleaning programs. Judging criteria are based on our 5 Steps to Green Cleaning in Schools. Applications for the next round of awards will be available in spring of 2019. Sign up for our newsletter to be notified when the application is posted. We look forward to learning about your green cleaning program!